1. Remove the stems of the kale. Rip kale leaves into bite size pieces & place into a large bowl. 2. Combine olive oil, lemon juice & sea salt to kale. Gently massage kale for 5 min. (this will break down the fibrous cell wall & make the kale easier to digest). 3. Add avocado to the kale mixture & continue to massage into the kale (this becomes your dressing). 4. Add the remaining ingredients & mix well. 1. Saute onions and garlic in 1 T olive oil until onions have turned translucent. 2. Saute mushrooms and zucchini separately, each with 1 T or less of olive oil. Add onions, mushrooms and zucchini to a Dutch oven. 3. Saute ground beef in its own juices breaking it up into small pieces as it sautes. When the meat is no longer pink, add to the Dutch oven with the onions, mushrooms and zucchini. 4. Add chopped tomatoes, tomato paste, oregano, basil and ground pepper to the mixture. Add enough water to make a sauce. Cook at medium until sauce boils. Then simmer for at least 1 hour. 5. 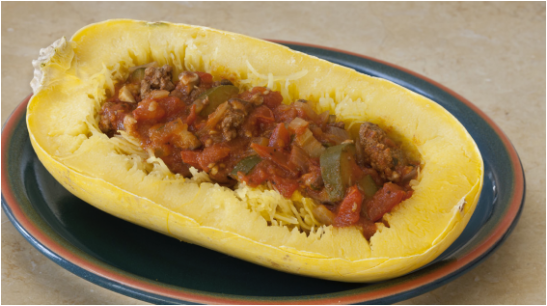 To make the spaghetti squash, preheat oven to 375. Cut the spaghetti squash in half and remove the seeds. Place squash halves face down in a baking dish with about an inch of water. Cook for 45 min. When squash is done, let it cool for 5 min. Run a fork through the squash to shred it like spaghetti. Plate the squash and add sauce over the spaghetti squash. 1. Preheat oven to 350 and lightly grease a 9" springform pan. 2. In a large mixing bowl, whisk together all the dry ingredients until well mixed. 3. In a separate bowl, whisk together all wet ingredients until well blended. 4. Peel pears for topping and cut into halves. Remove cores and thinly slice pears and set aside. 5. Pour wet ingredients into dry ingredients and mix as briefly as possible to combine. Pour into prepared pan. 6. Arrange pear slices fanning out in a pinwheel pattern or other desired pattern. Bake cake for 45 min. or until cake is lightly browned on top and a toothpick inserted in the center comes out clean. Remove from oven and cool before removing from pan. This superfood salad is rich in so many ways. The kale and broccoli, both members of the cruciferous family, support important detoxification pathways, provide antioxidants to neutralize free radicals and possess anti-cancer compounds. While the salad is high in fat, most of the fats are the healthy kind provided by avocados. This salad is a good source of dietary fiber, helping to make the digestive tract more regular. Vitamins A and C make it a great way to boost your immune system as the seasons are changing. And vitamin K helps build stronger bones. 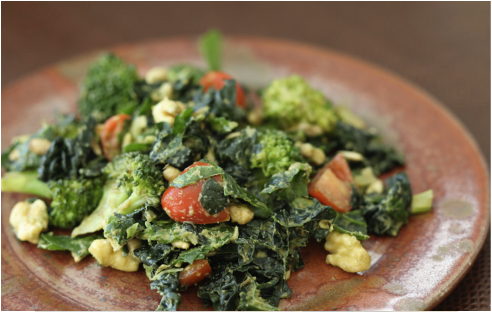 Try adding this salad as a side to a meal or as a stand alone with some additional protein! This childhood favorite has been adjusted to add more fiber and remove the processed pasta. Grass-fed beef provides important anti-inflammatory omega 3 fatty acids to the diet. I like using fresh, local tomatoes if possible that are high in lycopene and low in calories. The addition of shiitake mushrooms provides immune support as cold season is approaching. Changing out traditional pasta for spaghetti squash creates another way to way to incorporate more vegetables and fiber into our diet. This meal is high in vitamins A, C and K. It also contains niacin, B5, B6 potassium, manganese, selenium and zinc. 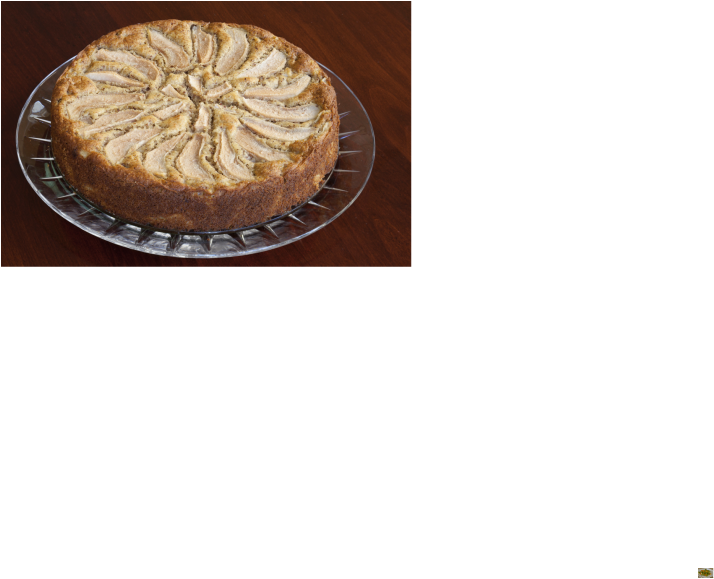 This pear cake is a beautiful way to present our fall pears. And just in time for the holidays! While it is high in natural sugars from the pears, the good fiber found in pears helps to offset those sugars. The cake is a very good source of manganese. It also contains some of the B vitamins, which provide energy to the body. Note that there is no added fats resulting in the cake having little fat and no cholesterol. Enjoy this in small quantities and be ready for your guests to ooh and aah over how delightful this cake looks and how delicious it tastes.